The Jaguar was a cooperative venture between the French andBritish aerospace industries to produce a tactical strike fighter. Both Dassaultand Bae were involved in the design of the plane and they are remarkablysimilar, differing only in specific equipment desired by the separate air arms.In total, a few over 400 aircraft were built, with half going to the French AFand half to the RAF. There were also a small number supplied to Nigeria, Omanand Ecuador. Prototypes flew in 1968 with first training units getting theiraircraft in late 1973. Production for the RAF ceased in 1977 with 165 singleseat and 35 twin seat aircraft being delivered. Over the years, they haveundergone the usual modification and suffered the usual losses. At one time,there were a total of eight front line squadrons flying the Jaguar in the RAF.These aircraft supplanted Phantom squadrons, with those aircraft replacingLightnings in the air defense role. As the Tornado came into the force, a number of Jaguar unitswere themselves replaced with the larger swing-wing aircraft. Currently thereare three Jag squadrons; 14, 54 and 16. 16 squadron is actually the OTU(Operational Training Unit) where pilots from flight school or other types learnto fly and fight the Jaguar. By this time, all of the Jaguar fleet is in arather boring grey scheme that seems to have taken over for modern tacticalaircraft. However, there are several specially painted aircraft that appear fromtime to time. The one in this kit is for the 16 Sq flight display aircraft, in avery nice semi-matte black scheme. Despite the increasing age of the fleet, theonly replacement on the horizon would be the Eurofighter or a similar Britishdevelopment. The date on this kit is 1985. Hard to believe that it has been over fifteenyears since this kit first appeared on the shelves. When it appeared back thenit was on the cutting edge of model technology with nicely engraved panel linesand the ability to do several variants. Probably the biggest area where kitshave improved is the interior. This kit is typical of the time (and typical ofmost current Hasegawa 1/72 kits) in that instrument panels and side consoles aredecals. The seat is OK, but a bit plain and the serious modeler will replaceit. A very nice touch is that there is a full weapons suiteconsisting of Matra missiles and British rocket pods/bombs. 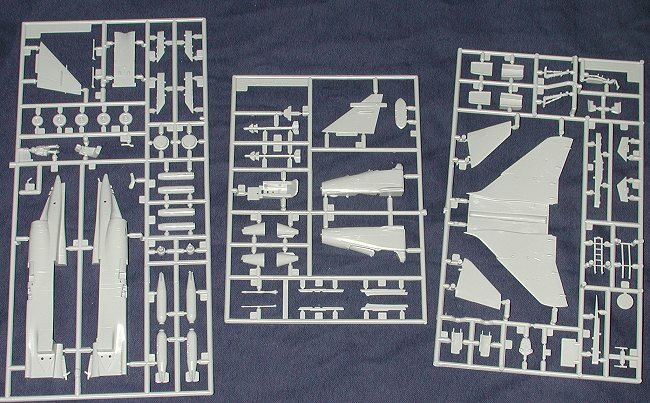 As you can see fromthe sprues, you can build a French Jaguar with this kit as both noses and tailsare given. The British nose does not have clear bits for the laser range finderso you will have to either cut that part away or paint it black. You have theoptional overwing missile rails and a boarding ladder included. Instructions are typical of Hasegawakits and are very good. Paint references are for Gunze paints, though you caningnore those for the outside colors. As many of you know, Hasegawa is known forgetting maximum mileage out of a kit. It does so by basically doing a new decalsheet. When you open the box, you will see the same instruction sheet from 1985with an addendum sheet for the new decals. These are Hasegawa made decalsand have all the pluses and minuses that accompany that. The plusses are thatthey are well made and in register. The minus is that they are a bit thick. You mustuse very warm to hot water to apply these decals so that they can properlysnuggle down. Using a setting solution can cause major problems (likepermanent wrinkles) so it is not recommended unless you are feeling brave! Overall,this is a really nice kit. I know that there is an Italeri kit of this planethat is years newer in design. Not sure how much better it is as I have notbuilt it. However, I did build this kit about 9 years ago and used a bunch ofaftermarket stuff on it. I was quite pleased with the result and it is still afavorite. Here is a link to that review. Review kit courtesy of MarcoPolo Importers. Thanks for your support. If you would like your product reviewed fairly and quickly by asite that has over 1,800 visits a day, please contactme or see other details in the Note toContributors.